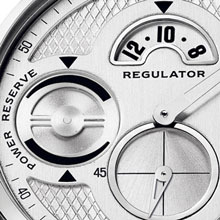 Regulators first appeared at the end of the 17th century, in the field of chronometry. These symbols of precision were used by watchmakers to verify the rate of watches. Four centuries later, Louis Erard pays tribute to this highly-respected instrument with the launching of its 1931 Regulator – Power Reserve. A blend of ancestral tradition and modernity, this watch from the alchemist of Le Noirmont is a veritable master stroke. 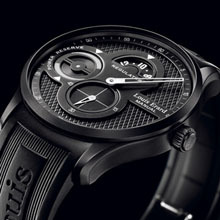 Using one of the original pillars of horology, Louis Erard has combined its precision with an ultra-innovative design. Beating at the heart of this exclusive model is the brand new module made by Soprod, a  complication that Louis Erard has fitted as a world premiere onto one of its original movements. The 1931 Regulator, one of the brand’s most emblematic models, has been totally reinvented in an Haute Horlogerie spirit: a beautiful and sophisticated movement in a resolutely high-tech case. The traditional hour hand has been replaced by a disc system, while the contemporary guilloché dial reveals a truly original power reserve display. The meticulous finishing, satin-brushed or black sand-blasted PVD, makes a lively contrast with the rubber strap. 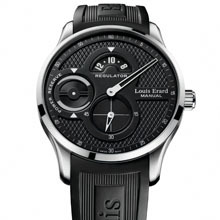 With Louis Erard, high-tech design and cutting-edge horology have become synonymous with accessibility.